On Saturday January 7, more than 100 neighbors and community leaders gathered at Pieter Godfreys recycle, sustainable development, and river corridor watch complex to learn more about his project and to discuss reuse practices. Godfrey salvages wood, brick and decorative stonework from buildings that are being torn down. 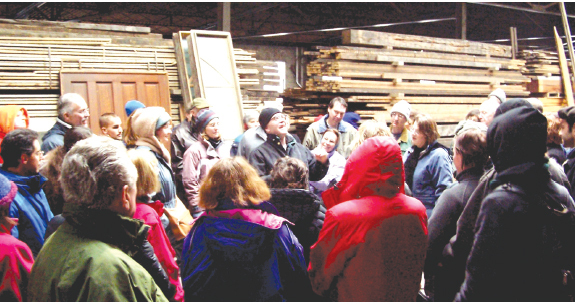 Godfrey led a tour for the group through three factory buildings, including a warehouse of dozens of types of wood and his personal woodworking and metalworking shops. He does renovation jobs across the Midwest, for which he hires city residents. His jobs use up to 80% products that are recycled. Old wood in a new building makes it come alive, said Ken Leinbach, executive director of the Urban Ecology Center, located next to Godfreys complex. Examples of old wood in the UEC include a table made from an old bowling alley and patio planks from the Atlantic City boardwalk. In this throwaway generation its good to hear other people saying what Pat and I have always practiced and believed. People need to take responsibility as the numbers grow. We have finite resources. If we make changes in our own small corners of the world, we have to believe that it really adds up. As part of their recycling efforts, Margee and Pat have gone dumpster diving to salvage old wood and doors for restoration projects, and Pat rebuilds auto motors and engines. Susan Buchanan of WasteCap Wisconsin attended the event. WasteCap Wisconsins mission is to provide waste reduction and recycling assistance through business-to-business peer exchange, demonstration and education for the benefit of business and the environment. Buchanan has worked with Godfrey to assess and document the materials that can be saved and reused from demolished buildings and construction jobs. There are some downtown developers in attendance who are thinking about sustainability, she said. In addition to recycling, water was foremost in many peoples minds, due to the complexs location on the Milwaukee Rivers east bank. I do not want to see more condo development on the river. We are blessed to have the Milwaukee, Menomonee and Kinnickinnic. Id like to see a rebirth of the river valley, said Godfrey. His comments were met with applause from the crowd. Donovan Riley called the event, remarkable. Riley is a board member of the Urban Open Space Foundation. Their mission: to work with communities to create and revitalize public places and green spaces. Riley was born and raised on the East Side. Recycling is terribly important. I appreciate the comments heard here today about preserving the river. Commitment and passion help make a difference, he said.